I read chapters 5-10 in one sitting (definitely whilst star-fished on my bed trying not to die in the heat - I know that's an image you guys want to imagine). It was good. In fact, it was pretty darn good. But also, it was a let down. Actually it's hard to say it was a let down because in truth it wasn't, but it does pale in comparison to the first part. It's like reading the PHEW after something really intense, only it's quite a long PHEW. I guess in a way it balances out the extremes of the first part, and gives us a glimpse of a more subdued Johanna as she gets into the nitty gritty and begins to create herself. Johanna reels through a list of potential names in the hope of finding the perfect persona to 'fly it all the way down to London, to my future'. I'm personally a fan of Eleanor Vulpine, though I'm almost certainly biased. So she settles on Dolly Wilde who happened to be the niece of Oscar Wilde and brought her own scandalous life to the Wilde family tree. After changing her name, Johanna becomes a writer for a music magazine and this is the journey we follow her own through this section. Dolly Wilde is Johanna's 'early 1990s prototype Tamagotchi' (who else remembers these?! I could never keep them alive). She blu-tack's lists of attributes she would like Dolly to have to her wall (a 'this is who I am' mood board in effect) and literally re-creates herself physically - think black eyeliner, dyed black hair, a whole lotta black clothing and a top hat. The top hat is my favourite thing, particularly when she's desperately trying to keep it on her head during the gig. Basically, I'm just saying that I still love Johanna and I still love Moran for writing the girl that many girls were/are/will be - desperate to be liked, loved, successful, special and, yes, just a little bit beautiful. Hell yes it does! It also needs a raincoat from all the beer and sweat flying around those tiny venues. I loved Johanna's first gig experience and her decision to be an 'onlooker of youth culture' instead of an 'animal'. It's awesome, funny, and just a little bit entirely true. You can pre-order the book from The Odyssey Bookshop here (US), or buy it from Foyles here (UK). By the by, if you've not seen this video please watch it now. Oh lord, my Tamagotchis ALWAYS died. Ugh, mine too. I remember thinking I was going to be an utter failure as a mother. Ha, I'm still pretty convinced of that! I confess to being a lot older, so the 90s were way past my teens, but Johanna still strikes a chord with me. Not to mention reminds me why you couldn't possibly pay me enough money to go back to my teens. I can't imagine anything worse than being a teenager all over again. Particularly in the world as it is now...way too much stress. I totally wish I had learned to be an onlooker at an earlier age. I spent way too many years smooshed against partitions and now I just sigh and shake my head at those kids from the back while my beer sits comfortably in my hand. Me too, I think I had the epiphany that standing at the side was much better when I hit legal drinking age. I'm Katherine, Katie to close friends and family, but in high school I was often known as Kathy. What a horrible piece of work Kathy was - so desperate to fit in and to be liked! I killed her off for good when I set off to university. There is a regular customer who insists on calling me Kath or Kathy and I hate it. She is NOT me. The name looks like that of a stranger now. It's amazing how much a name can change you. I can't bear thinking about the person Nell was now - shy, awkward and so terrified in every social situation. I'm Eleanor or Ellie for good now. Oh I loved her mention of rock music needing supportive bras. It made me smile, because I knew exactly what she meant. 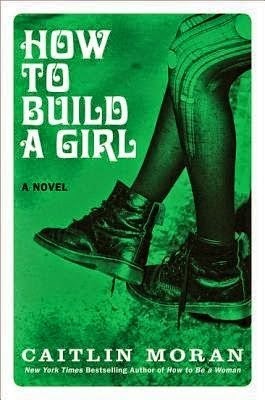 I think what How to Build a Girl does best so far is to remind us all SO MUCH of our younger selves. That being said, I think this section was a bit of a letdown from the first as well. I'm thinking it might be because I literally know NOTHING about the music scene in which she's journeying through. I'm actually not blessed in that department, but even with my meagre frontage I needed supportive bras! I think I'm a bit young for the music scene. A lot of it is vaguely familiar but as names only, not as actually bands I know or remember. Thanks :) I always hoped that everyone would suddenly start to like me and that the 'nerd' would all of a sudden be the popular kid. Alas, it did not happen. Aw, my sister, cousins and I all used to leave our tamagotchis with our nan and she would feed them for us while we were at school! I was obsessive with my tamagotchi, until I dropped it in the water at the beach, cried and then moved on to whatever the next toy of the moment was. I was awful at keeping it alive though. I always wished for a name that was easily separated into nicknames. I've had a few friends call me Kay, which I hated because it seemed like an old lady name. Kayles, but that was mostly family. And no one ever called me Leigh. I did go through a phase when I wanted to change my name to the traditional spelling, Ceildh, but thought better of it thank god. So I've always just been Kayleigh, which always made shifts in style/attitude feel way more permanent since I couldn't cast off the name that went with that phase. If you know what I mean? "Kayleigh" is the worst for nicknames. Just chiming in to agree, here. "Kay" is only OK if it's actually "K." The "ay" adds 60 years. My mom's given up and started calling me "Katie," so. I loved my tamagotchi! I'm pretty sure I did eventually get bored and just let mine die though. I'm impressed with your ability to reinvent yourself! I often wanted to as a teenager, but I don't feel like I ever actually changes substantially. I think it would have been fun to try a bunch of different personas, but it's hard when the people around you already have ideas about who you are. That freaking top hat is so embarrassing and endearing. Also, I wrote that "drawing Dolly Wilde on top of my own face" quote down, too! Also, holy crap; replace "goth girl" with "hippie chick" and we went through the exact same personality evolution. After that, we diverge, but still. Hello, kindred spirit! Nice to meet you. Final also, 20 points for the Woman in White reference.